A cheesesteak from Liberty Cheesesteak Company. JP Teti, who started the company, is expanding and rebranding next month when he'll open the restaurant Passyunk Avenue in London. JP Teti is giving Londoners a little taste of Philadelphia. Teti, 39, grew up in Lawrenceville, N.J. But his family has deep Italian roots in South Philly, and he's now earning recognition for the City of Brotherly Love's signature sandwich recognition. He launched Liberty Cheesesteak Company, a food truck parked in London's Old Spitalfields Market, in 2015 after leaving the corporate world, with hopes of helping Brits understand that it's not all hamburgers and hot dogs in America. Customers line up outside the Liberty Cheesesteak Company Truck. Now, with the help of a few investors, he's expanding and rebranding next month to a brick-and-mortar location called Passyunk Avenue in London's Fitzrovia neighborhood that will feature not just cheesesteaks, but also roast pork and meatball sandwiches, soft pretzels, citywide specials and scrapple. Teti, who has lived in London for nearly 10 years, hopes to give off a dive-bar vibe, which he called "a concept that's not really understood in Europe." The cheesesteak recipe he crafted — complete with thinly sliced rib-eye beef, soft Italian rolls and a housemade cheese whiz — has garnered a few accolades. Buzzfeed ranked it as the No. 1 sandwich that "every Londoner needs to eat" in 2015, while The Londonist named Teti's cheesesteak as one of the 100 best sandwiches in London last year. "We had this initial shock from the locals who have had to sort of 're-understand' what a sandwich is, and then I think comes a deeper appreciation for what we're doing in general," he said. Teti said he's using the sandwich as a catalyst to bring a greater appreciation of Philadelphia, its culture and its rich food history, to London. His plan seems to be working. 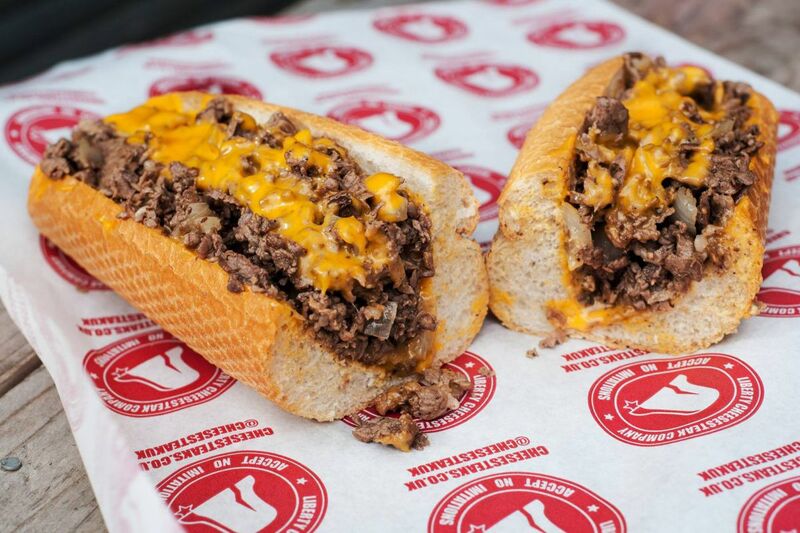 Londoners are warming up to the cheesesteak and are having no problem pronouncing "Passyunk," he said. What really throws customers off is a hoagie. "You say 'hoagie' to someone and their eyes cross," he said. " … we might as well be speaking Japanese to British people when we say hoagie." A Liberty Cheesesteak Company hoagie. The London food truck is now opening a bricks-and-mortar location. Passyunk Avenue's opening — the exact date will soon be announced on Twitter @PassyunkAvenue — comes ahead of the Philadelphia Eagles' visit to London to play the Jacksonville Jaguars at Wembley Stadium in October, and after the Philadelphia 76ers were there to face the Boston Celtics. A devout sports fan himself — Teti's Vespa helmet has the Eagles' signature wings on both sides — Teti said the recent NBA London Game helped drive business to his Old Spitalfields Market location, and he's excited for Philly fans to visit Passyunk Avenue this fall and beyond. "We're excited that they're coming," Teti said. "But, my goal is to make Passyunk Avenue the epicenter for Philly fandom."